Shoshana was diagnosed with bilateral hearing loss at age five and became profoundly deaf at fourteen. Her love of animals and desire to help her community drove her begin volunteering her weekends at a local animal shelter from a young age; there she was immersed in basic obedience training to help adoptable dogs find forever homes. In high school she developed complex partial seizures and severe vestibular migraine episodes. Originating from the personal need for a dog to assist with the effects of multiple disabilities and without a program able to provide such a dog for her unique needs, Shoshana began working with and training service dogs in 2009. In 2013 she became heavily involved with training and program development with Canine Assisted Therapy (South Florida) where she also volunteered with her dog, Macy, by working with children on the Autism spectrum and those with other developmental special needs. Shoshana was a volunteer group leader for Southeastern Guide Dogs in Palm Beach Florida for a period of time before moving to Texas to train diabetic alert dogs. Her passion of granting others independence through partnerships with highly skilled assistance dogs drove her to establish Topaz Canine Services in 2016. Robbie was influenced growing up with a mother who lives with multiple chronic conditions. Having witnessed the challenges she faced with pain and mobility he was interested in adaptive technology design and function. In 2014 Robbie began mentoring under Shoshana in the field of service dog training and has since been involved with daily training operations. Robbie is a strong advocate of greater accessibility and technology to enhance the quality of life and equal opportunities for those with disabilities. He is actively involved in the education of businesses and the general public on disability awareness, rights and etiquette. Dillman is a retired Senior Information Technology and Security professional who specialized in taking business ideas to a financial services product. He was responsible for the design, development, security, quality assurance testing and user acceptance testing of financial products and services for Cardtronics when he retired. During his career he specialized in transactional security compliance adhering to various security governance bodies and top retail and banking financial institutions. In addition to his involvement with Topaz Canine Services he proudly serves as a volunteer at the Prince of Peace Christian School where he is a member of their Advancement Committee, Development Committee and Auction Committee. Dillman also dedicates time as a life and skills coach for college students and recent college graduates by mentoring, working through resume and interview skills, and assisting them with job leads. Bill began his career as a night shift computer operator for CBS Toys a division of CBS Inc. Over the next three years he was promoted to Programmer/Analyst and then IT Department Manager. He next joined Tyler Pipe Company in Tyler, TX as a Programmer/Analyst before migrating to Dallas, TX in 1989. Here he began a long career with 7-Eleven Inc where he held numerous positions within the IT department, his career progression involved design and development of many of the systems used within the company. After leading the design and development teams for Advanced Functionality ATMs Bill was asked to take over field operations as Director of Operations for VCOM and ATM, managing all the servicing and support for 1,000 VCOM and 4,500 ATM machines. In 2007 7-Eleven sold the ATM business to Cardtronics, Inc. and Bill transferred to Cardtronics as SVP for Advanced Functionality and managed both the business development and field operations for the multi-function ATM fleet. In 2014 Bill retired from Cardtronics Inc. as Senior Vice President for Software Development after a career spanning over 30 years in the IT industry. Bill has a lifelong love of dogs and is excited about his involvement and support of Topaz Canine Services mission. 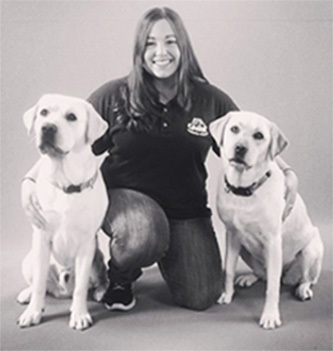 Debra Berger is a native of Denver, Colorado and is the co-founder of Canine Assisted Therapy, Inc., the premier agency that recruits, trains and certifies therapy dog teams to provide services to thousands of individuals in need in South Florida. Debra served as the executive director from 2009-2014. Since 2009, Debra has devoted herself to not only providing quality pet therapy teams to those who can benefit from the love of a canine companion, but to educating the public on the different types of working dogs and service animals. Her passion includes being an advocate for the working dogs and their handlers since few dogs are appropriate for this type of work. 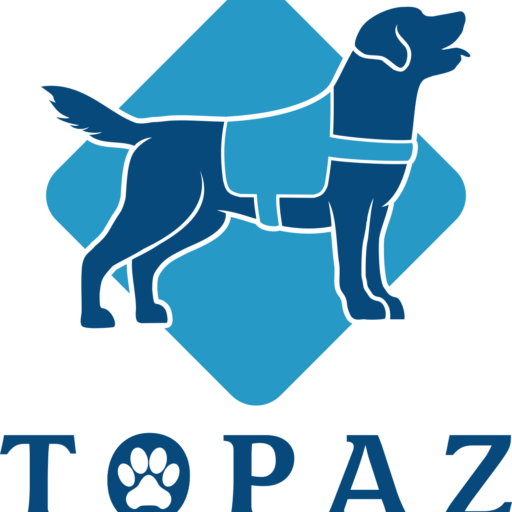 Q: What types of Dogs does Topaz Canine Services use for training? A: Topaz is proud to use rescue dogs from shelters. For this reason, Dogs can often be mixed breeds. We also work closely with Breeding partners to provide Labradors and GoldenRetrievers.